What a bangin' month for dividends! I don't think I've ever seen the list so long. It seems like I was getting an extra little payday twice a week during June. Some of these dividend stocks I've held since closer to the beginning of my journey back in 2012. CCP: Care Capital Properties, a healthcare REIT, came through with a nice dividend this month of 57 cents per share. They're a young stock, and haven't done any dividend raises yet, but the yield is huge at 8.44%. LTC: I get a little dividend from LTC Properties, another healthcare REIT every month. It's nice to have a monthly payer in the mix. 19 cents per share, as usual, for a yield of 4.44%. Can you tell that I'm into healthcare REITs? VHCIX: Another little drop in the dividend bucket from the Vanguard Health Care Index, which I bought a tiny bit of when I was first starting out. BP: Another one of my first dividend stocks, BP has been coming through quite steadily. But it's been over two years since they've raised their dividend! I know that oil is at a low spot in the cycle, so I'll just wait it out. Thanks for the six bucks, BP. JNJ: Hey hey hey, they raised the dividend! At 84 cents per share, my payout becomes $14.28! The dividend diplomat guys are big on JNJ, and I'd have to agree. Johnson and Johnson pays a very nice stable dividend. ROK: Rockwell Automation's stock has taken off like a rocket since I've bought it. I guess everyone else it betting on automation, too? They have a recent history of raising the dividend once a year, so who wants to bet that my next dividend from them will be a little higher? MAT: True confession: I did something with this stock that I don't usually do. I bought it only to hold it for a short amount of time. Back in May, after a crappy earnings report, MAT stock fell into the toilet just before their ex-date, pushing the annualized dividend yield up to 7%. I could have lost big if they had continued to fall, but, as I guessed they would, they bounced back up. I sold for a little profit and pocketed the fat dividend. I don't recommend doing things like this. I maintain that buy and hold is the best way to make money. Short term trading is glorified gambling, and it was a lapse of willpower as an investor, and I got very lucky. But if I was unlucky, I would have either had to sell at a loss or be stuck with a stock I didn't long-term believe in for a longer term than I would have preferred. But a dividend is a dividend, so, thanks Mattel. UL: Unilever's dividend isn't quite stable, but it hovers around 33-39 cents per share. This quarter was not too bad at 37.8 cents per share. Thanks for the $9.45, Unilever! CHD: Church and Dwight, Arm and Hammer Baking Soda and their vast array of home and personal care products, pays a slender dividend of 19 cents per share. I bought this stock because I believe in the products, and sure enough, it has done well for me so far. COP: Aw, ConocoPhillips, sputtering along with its 26.5 cents per share dividend. I remember when they cut it from 74 cents per share back in 2015. I was pretty sad about that. But oil has its ups and downs, and ConocoPhillips is pretty much a straight-no-chaser oil stock, so I'll wait patiently for things to turn around. In the meantime, thanks for the $2.65, Loco Conoco. 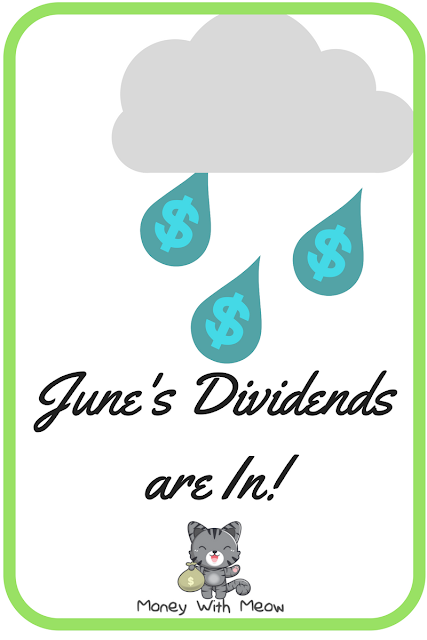 Dividend Total for June: $146.58!! Wow... a new record. Does it replace my paycheck? Heck no. But it covers my phone bill and some of my groceries, which is pretty awesome. July will certainly be a much quieter month as I am only expecting three dividends to drop. How did you do this June? Keep rolling that snowball! After a couple years you can definitely see the difference! P.S: Looking for a little more divspiration? 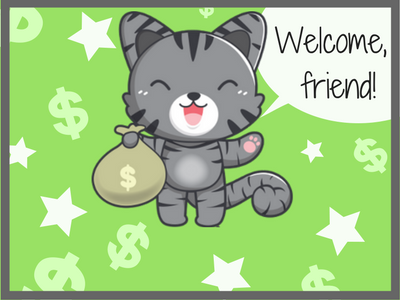 Check out my dividend friends at DivHut and Seeking the Dividend. Wow, awesome job! Thanks for the mention also! I like how you compare the divi income with current expenses, it's a good way to look at the progress. I also reached an all time high (post coming soon), pretty awesome to look back and tally it up, isn't it? Woah woah woah, great month here Meow. Like the move you made with Mattel. changing up your strategy and investing wit ha short term perspective was a very interesting move, but I really like it. Congrats on the great month and keep up the great work. We should be publishing our individual results on Wednesday and Friday. Nice job!! We have VHCIX too and I think...it stinks :p We had a great ride with BP. Now I hold $1000 in Prudhoe Bay (PBT) specifically. They've been quite generous with their dividends! That's a solid month there! It's always nice to see new records! Looks like an amazing June for you. Some solid names paying you with about a handful of names in common with my own portfolio. Keep up the good work.